The taste of home-grown Brussels sprouts, they are just so delicious!! and they look beautiful both in the garden and on the plate. For us they are a culinary highlight of the winter and this year, although there has been less frost than usual, they are tasting superb. Cold weather makes them produce sugars as frost protection, so in this super-mild December they are less sweet than normal, but their other flavours are still good. To keep Brussels plants in good shape, continue removing any lower leaves as they start to yellow, to reduce chances of rotting and slugs being attracted. Parsnips are another great winter veg and the photo shows 6.5kg White Gem which I levered out of just 13 square feet (1.2 sq. m) of undug soil. 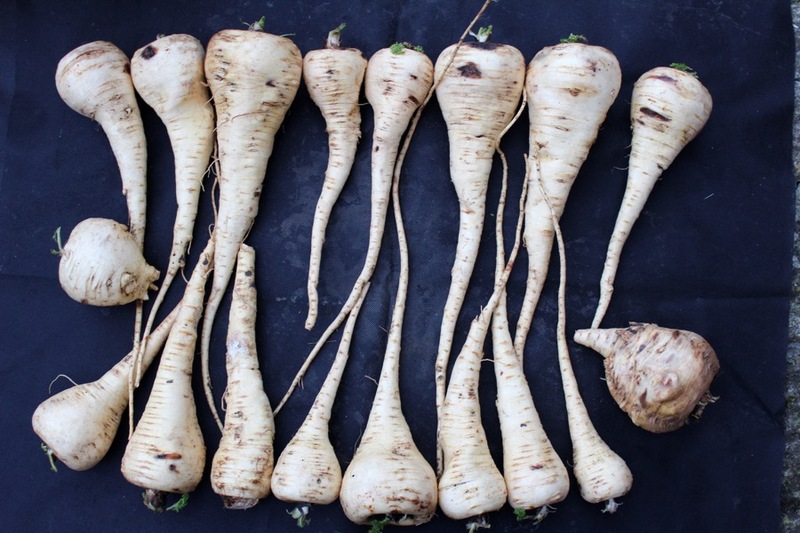 Its a lot of food from a small space and parsnips fill you up because they are denser than potatoes with much more dry matter, hence their ability to withstand frost. 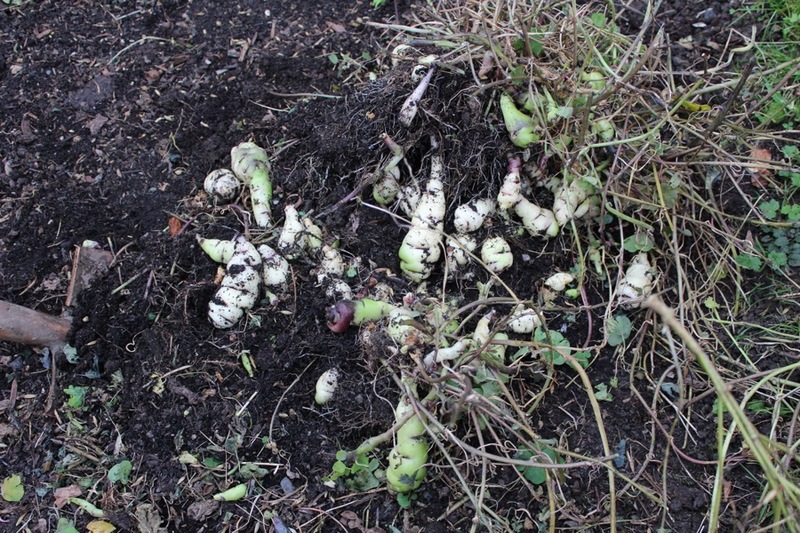 My yield is higher from spreading 2in compost (it was green waste with food waste added) last winter – its another myth that “compost makes parsnips fork”, as you can see in the picture! Another year of this trial has concluded, follow the link to find details including a table of 2015’s harvests- and values. After the final harvest of kale I again dug the left hand bed, and incorporated two inches of compost in each dug trench, about 8in (20cm) down. 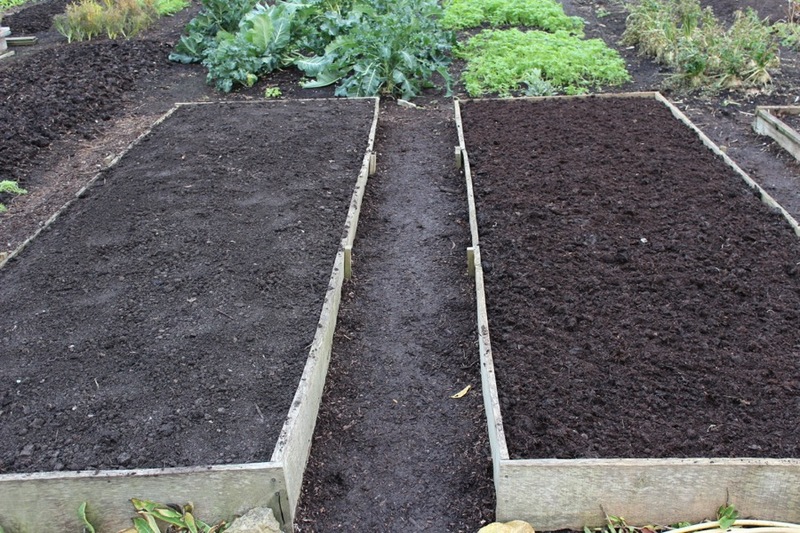 On the right hand bed I simply spread the same amount of compost, which takes three hours less than digging, saves my back a lot of aching, and gives slightly better crops, whose leaves often look glossier and healthier. I calculated the value of the 101.4kg (223b) veg from the 5×16 feet undug bed, its £433. From the dug bed it was 5% less. So why do most gardeners still perform the annual dig? The only time I can see its worthwhile is to dig in weeds rather than waiting for a polythene much to kill them – but even that you can do with compost, and digging is rarely effective against rampant perennial weeds. And as a routine chore, it really puzzles me. Is it because of a belief that there is no gain without pain? Its been a vintage celeriac harvest at Homeacres, my best ever, both of Monarch and Mars, seed from Bingenheim. From an 11 foot length of a four foot wide bed, the harvest was 124lb, so that is 2.3lb per square foot. Or in metric, its 56.4kg from 5 sq. metres which is 11.2kg per sq. metre. This results simply from applying 2in compost (in this case some old animal manure & some green waste) on top of fertile and undisturbed soil. 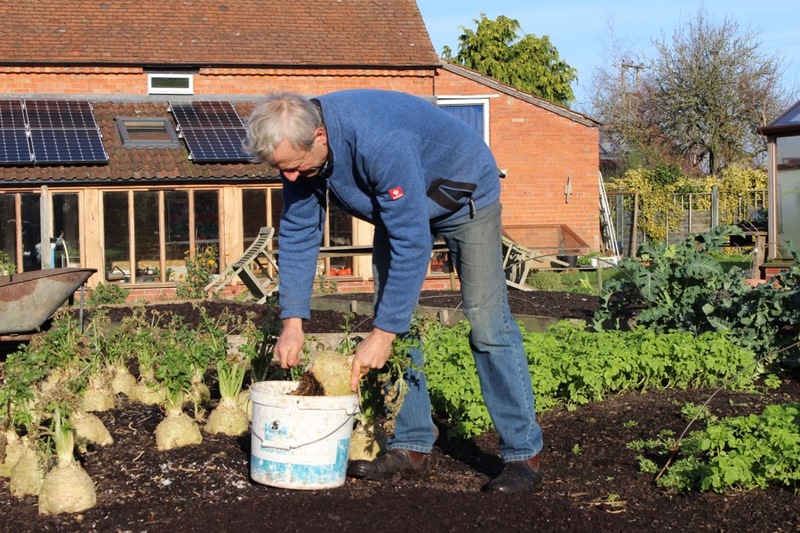 I sow celeriac seeds mid March in warmth, aim for sturdy plants by mid May, cover with fleece for three weeks after planting unless its hot sun, keep plants watered in dry weather, barely need to do any weeding – and that’s it! Harvesting is the longest part. 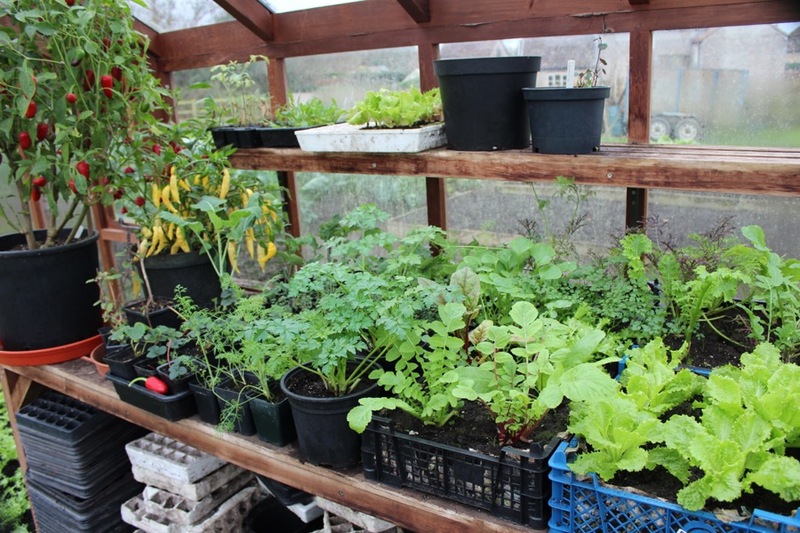 I find that celeriac is easy to store, now they are in crates in my shed which is a brick-walled annexe to the house, draughty and not entirely frost-free, depending on winter’s severity. 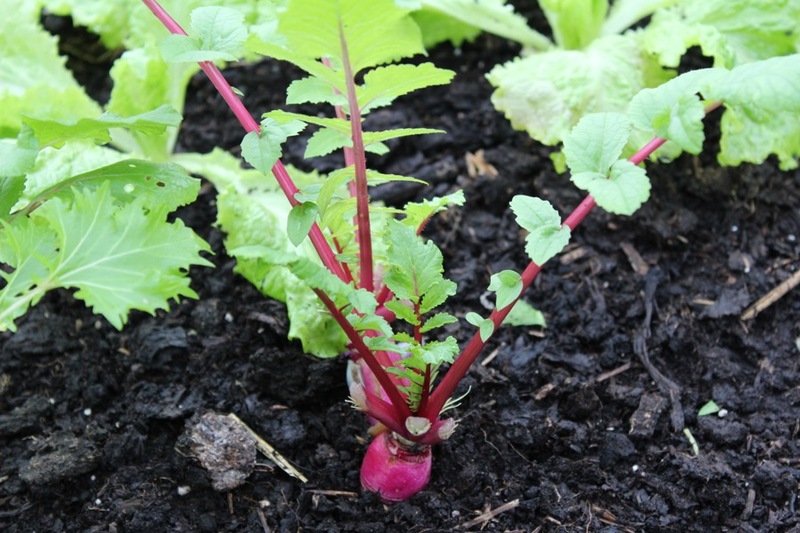 Currently its too mild for winter roots in store, for example beetroot are sprouting. I have left some in the ground as a comparison. 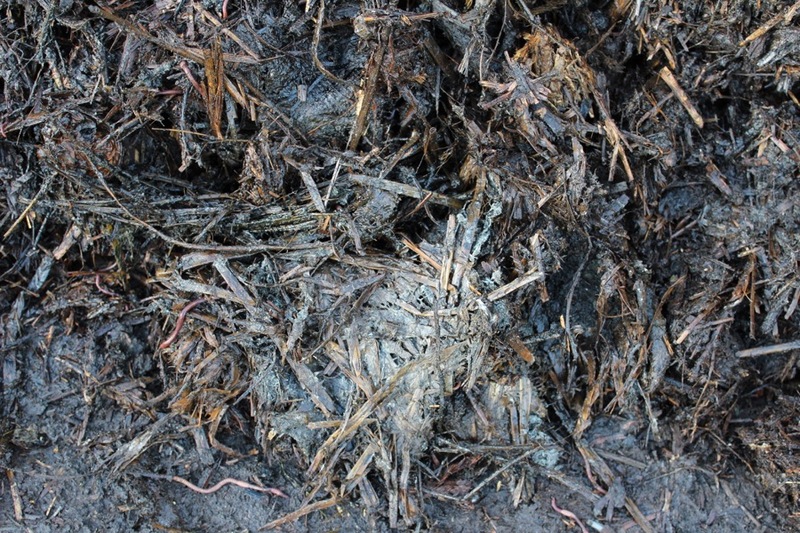 If slugs are not a problem, you can use mulches of less-rotted organic matter, but compost is best for not offering habitat to slugs. 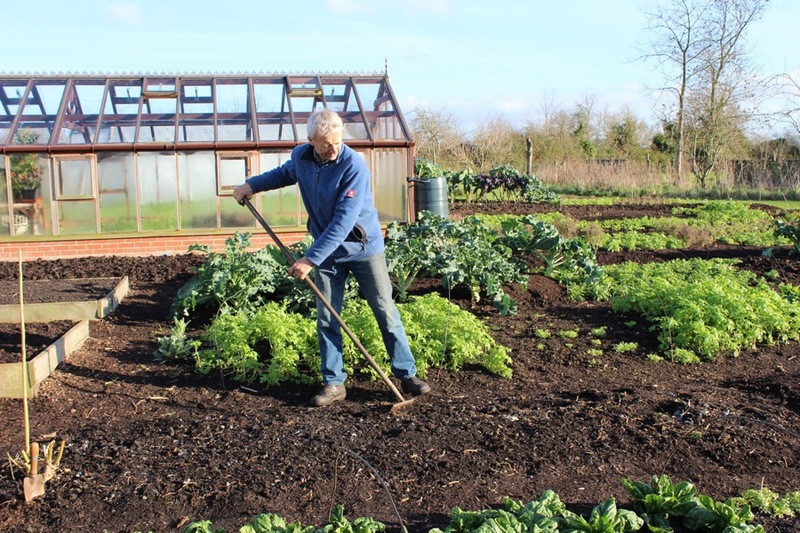 Vegetables need fertile soil and compost/well rotted organic matter is the key ingredient, unless you have a plot large enough to set aside an area to grow green manures for fertility. 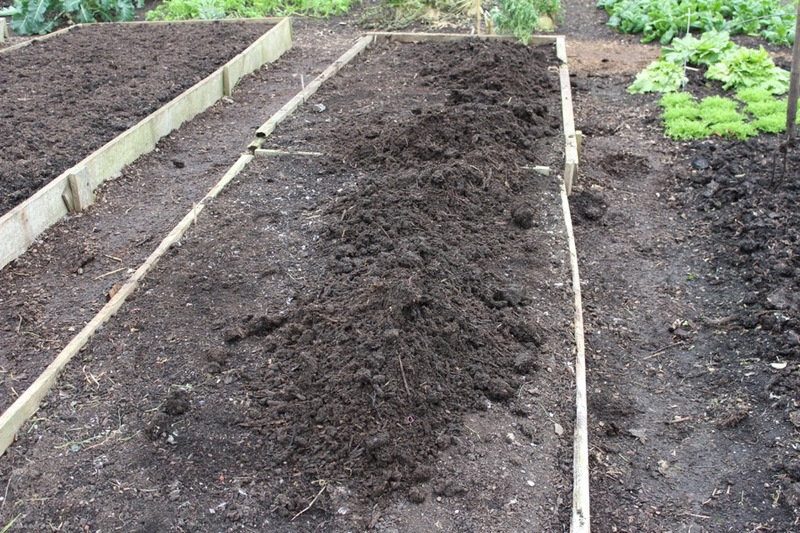 My average, annual dressing is 2in (5cm) of mature compost, but its difficult to measure so the photo should help. I reckon that you want to cover soil so that, just after spreading, no soil is visible. 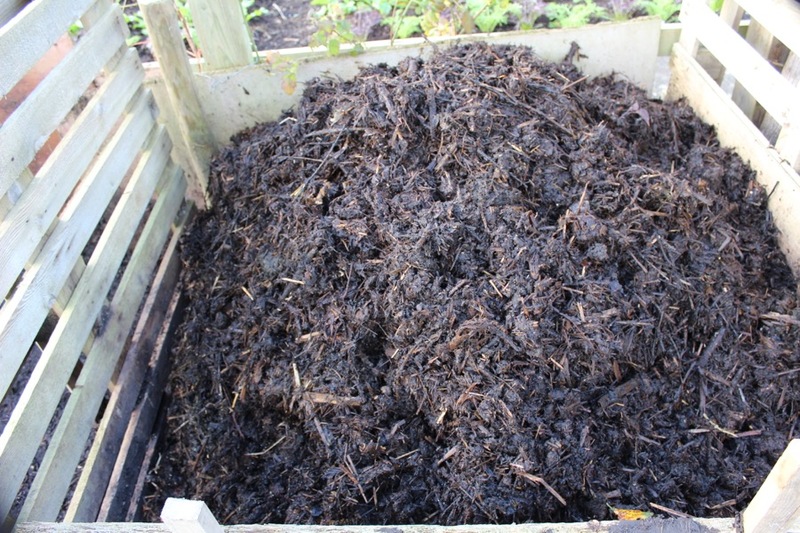 Then after some rain and the compost ‘settling’, it will look less deep, and will often be just a one inch layer by spring. 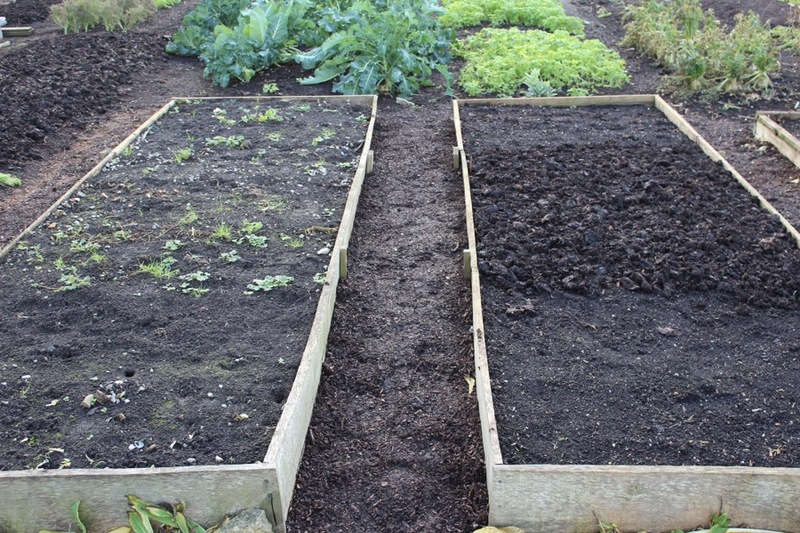 Quality of compost makes a difference too, I spread less if its older and fine as in the photo on right. 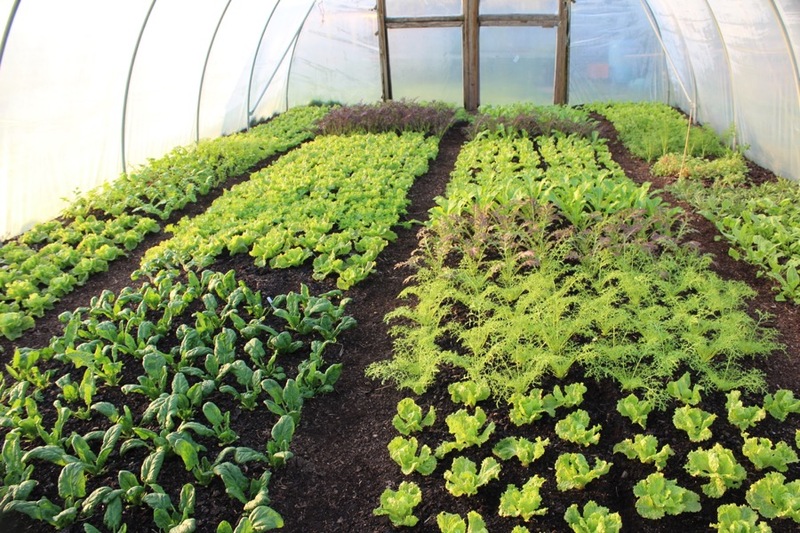 I find that quality improves if I turn a heap about a month after its last addition of new ingredients, as in the middle photo which is a heap I just turned and shall use in the polytunnel next May. Go weed free in no dig!!! A mature no dig garden grows very few weeds. I reflected on this while picking salad in the polytunnel where the only weeds are occasional seedlings of buttercup or grass (and bindweed in summer), which we remove while picking. 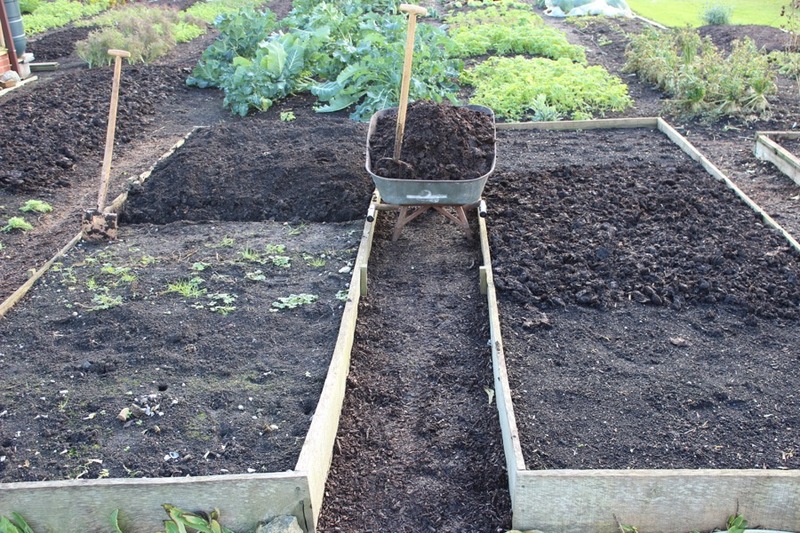 The surface compost always looks clean and neat around the vegetables. This saves so much time. The other source of weed seeds is newly-applied compost but don’t let that put you off! Weed seedlings are easy to deal with as long as you act when they are small, by running a hoe or rake through the surface on a dry day in early spring. The vital part is to do it when weeds are tiny, so they quickly die on the surface by the hundreds and thousands, in an hour or two of spring sun and wind. I grow for flavour and am not convinced by mashua roots (Tropaeolum tuberosae) – is anyone else liking them? The plant gave 2kg so no problem there, also its leaves are tasty in salad and the November flowers are sensational. 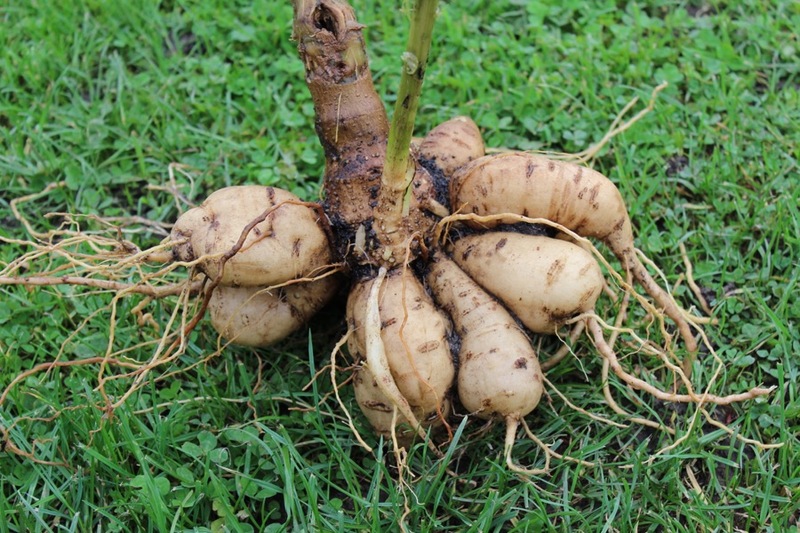 Dahlia tubers look promising but are stringy and fibrous, without a huge taste. I followed James Wong’s roti recipe and they taste ok but most of the flavour came from eggs and flour (freshly ground rye) and I struggled a bit to digest them, maybe from the fibres. 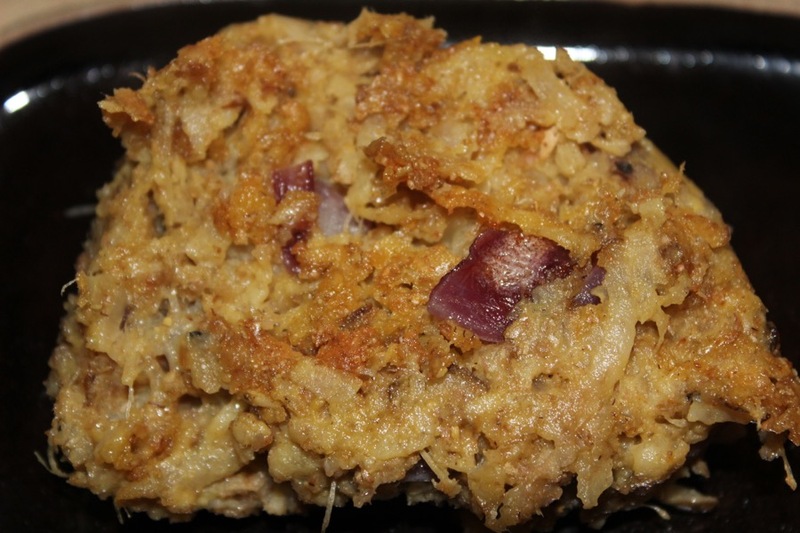 Fortunately, oca and yacon continue to impress, for example they are superb simply when roasted. 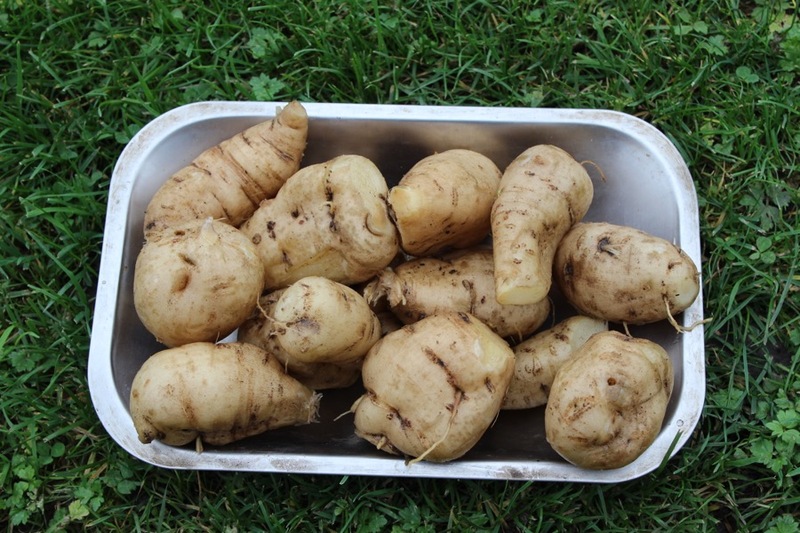 I had to harvest my swedes as they were in the dig/no dig experiment and the dug bed needed digging (another advantage of no dig). Otherwise swedes can stay in the ground, they are so winter-hardy, even in Scotland. 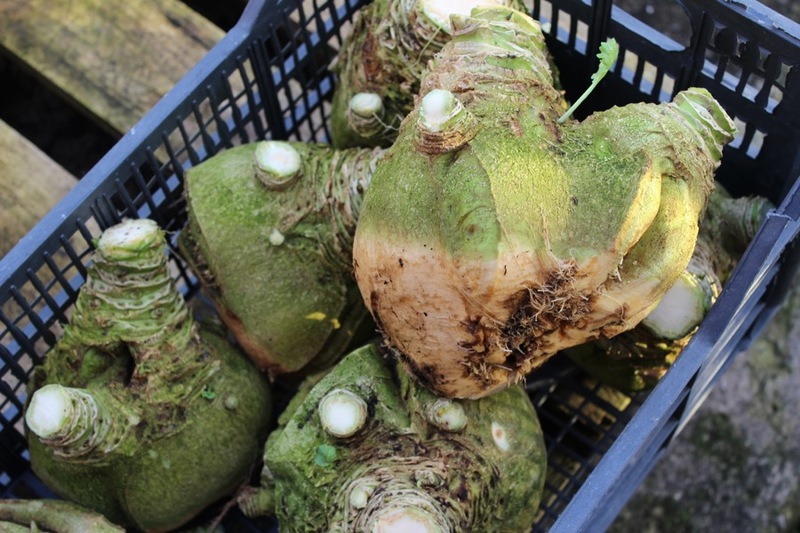 My roots have many stems because gall midge took out their main growing point in June, the plants looked knackered, then recovered, but for once damage was worse on the undug bed. 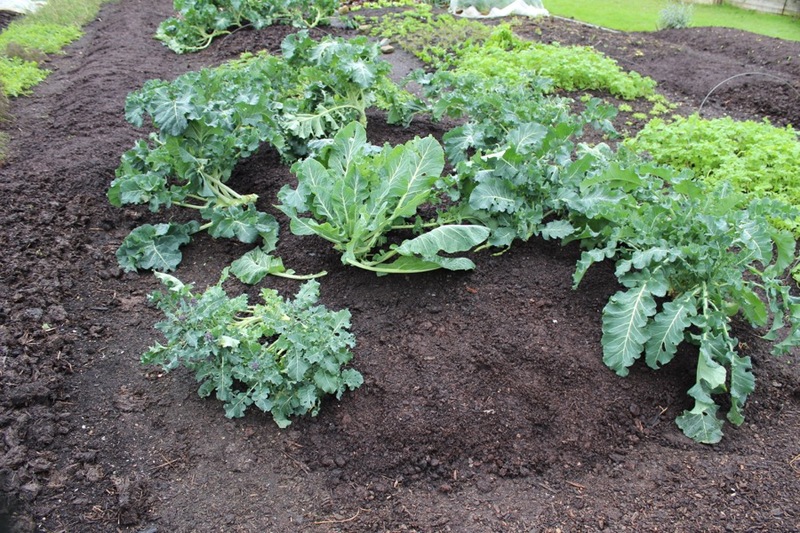 In contrast to that, kale on the dug bed had all the November caterpillars and there were none on the kale of the undug bed. 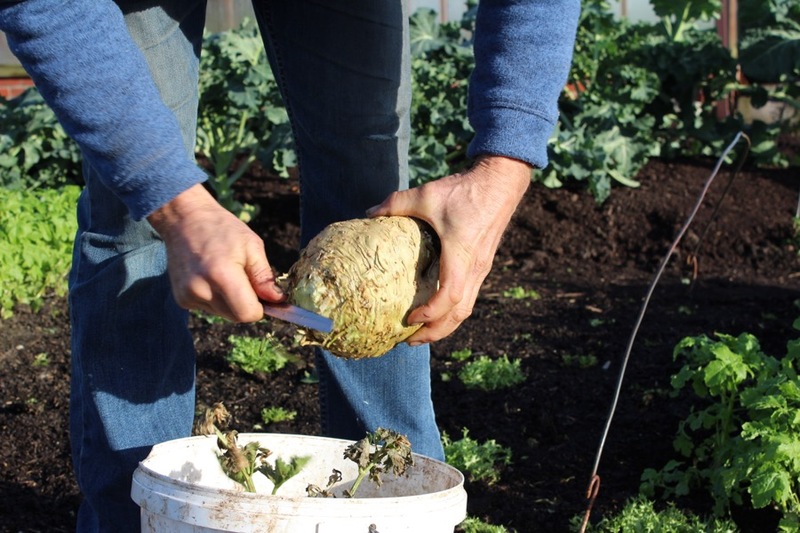 For other winter veg one you can mulch them with compost at any stage, then after clearing in the spring you are ready to resow, replant into the weathered and more crumbly compost. 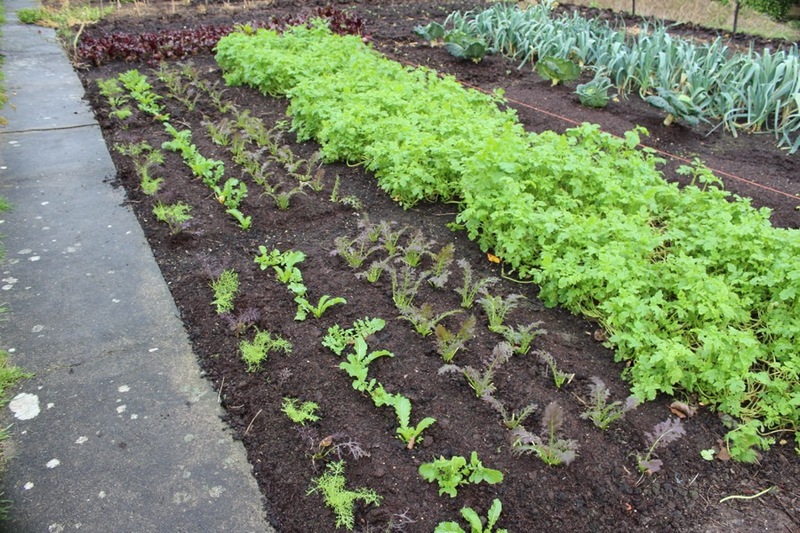 Its been a vintage month for salad growth thanks to the exceptional weather. The average temperature (night & day) during the first eight days of December was the same as during the first eight days of May! But there is less light than in spring, with just 8 hours between sunrise and sunset. This shows in leaf quality, they are relatively thin and flimsy. 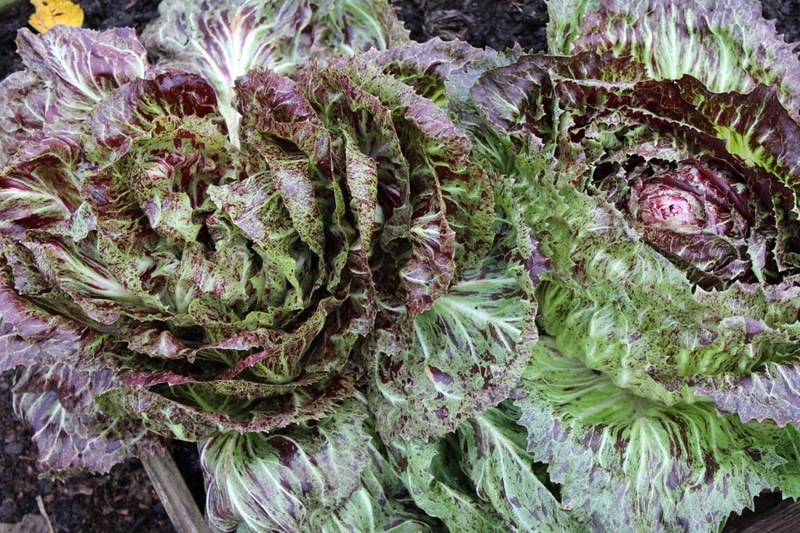 So the thicker leaves of radicchios and endive are a great contribution to winter salads. 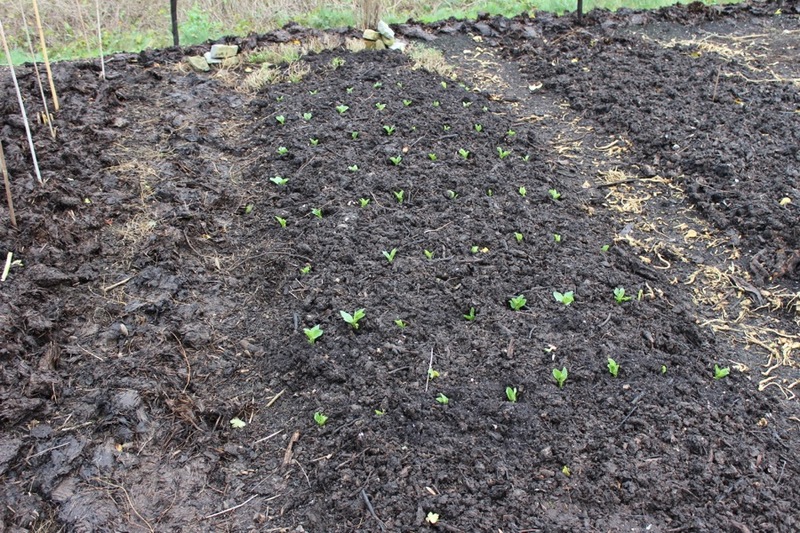 We have also been adding some heart leaves of Chinese cabbage which I sowed late July and planted after a harvest of dry broad bean seeds. 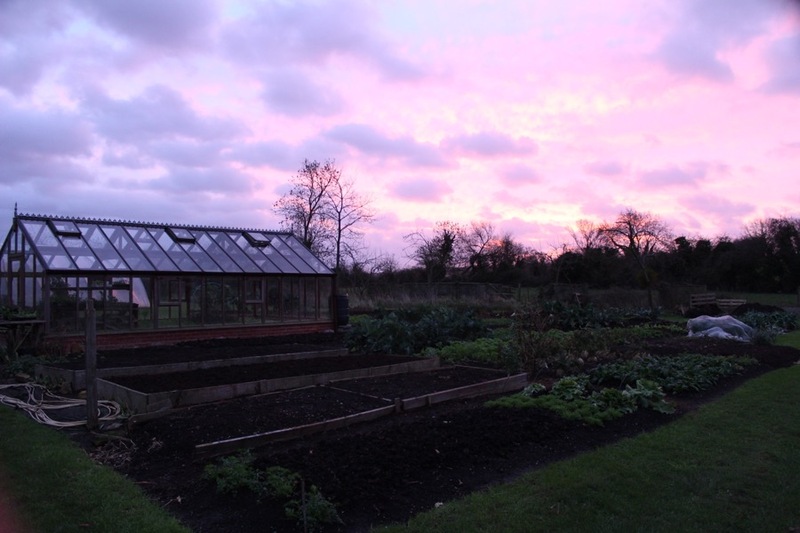 I cut the cabbage hearts in late November, just before the first frost of -3C, all explained more in my salad book. We are doing the year’s final pick on 23rd December, taking more leaves than usual to leave plants small over the holidays and give us a break from picking. It’s all looking good as usual. Can you believe this warm weather at the moment? Incredible but we’ll probably pay for it later, but I won’t mind if it’s cold enough to get rid of all the bad bugs. The Celeriac look great, shame about the multi-stemmed Swede, but at least they’ll give you a few meals. Is it worth growing Flower Sprouts? I get a lot of whitefly and mealy cabbage aphid so I think they would ruin the few leaves from a flower sprout, whereas with a proper sprout I could afford to lose a few outer leaves and still have a decent feed. I’ve not done a lot lately, had a hip replacement 6 weeks ago, but that means I should be up and running to collect my manure to make my hotbeds from mid January. I’ve done them 2 years running now and they’ve been a total success, earlier crops and at the end, masses of well rotted manure to spread around for no dig, what’s not to like? Hi I have grown flower sprout in my no dig garden for the last 2 years and find it an amazing veg. We eat leaves as the plant matures in September. We then cut the tops off to eat October / November. Around Christmas time we are harvesting the little flower sprouts. The 10 plants we put in usually then last until we start harvesting PSB February / March. Hello Steve, thanks for this fascinating info about flower sprouts, I had not thought to harvest them like that. Lovely comment about no dig too, and it makes sense in terms of the beneficial soil organisms which can proliferate (such as mycorrhizal fungi) and confer more ability on plants a greater ability to resist pest and disease. Good news about your hotbeds. Yes I find the compost is good as long as its straw bedding and not wood shavings! Flower sprouts are a bit irregular, strange considering they are F1. They grow more in January, February so are better later when Brussels are growing less. Top flavour, lower yield. Good luck with getting back into gardening. Those are amazing figures for how much yield you can get from one 5m * 1.5m bed, Charles. My targets are 100lb, except beds where potatoes are grown where 150lb is more the norm. Do you think yields are higher by having just one or two rows of each crop so you have a big variety of crops in one bed? 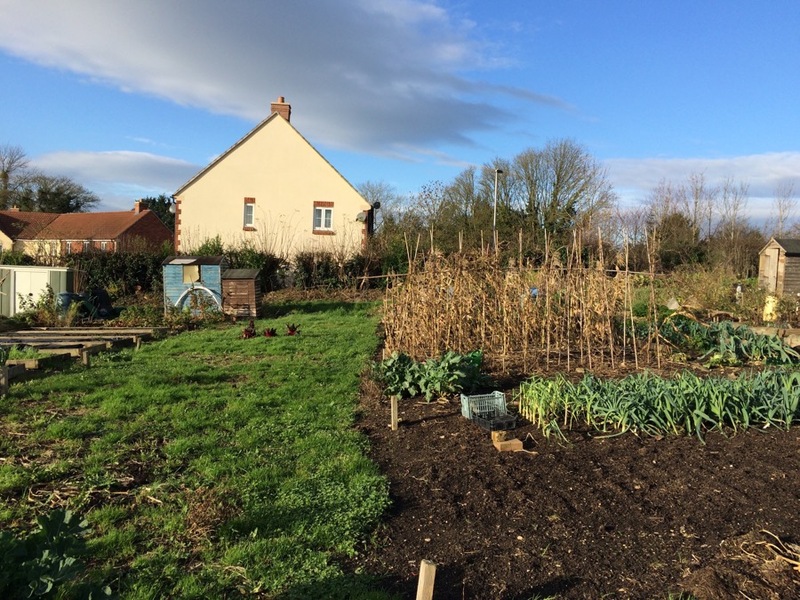 Clearly, there’s a philosophical decision to take if a normal approach is to have only 2 – 4 crops per bed at one time (obviously with second crops the total in a season might be more)? Also whether you need to rotate crops (presumably you always align the tallest plants at the northerly end of the bed with the smallest at the southern end)? Happy Christmas to all at Homeacres……. Yes rotation is tricky when growing plants cheek by jowl as I do in these beds, and they are only three years old. Courgettes for example are better on their own…. Al Lower Farm I grew like this for 6 years and yields stayed high. I think that 100lb is a good aim. what’s “flower sprout” .. ? 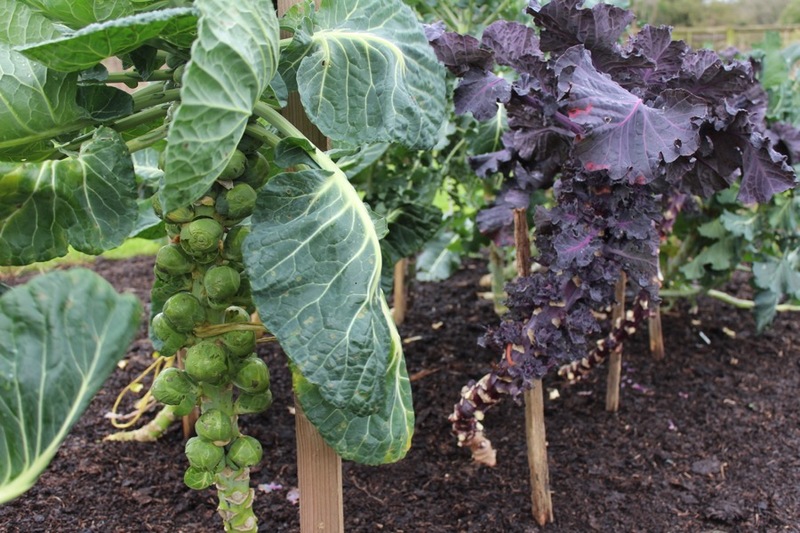 .. i’m over here on vancouver island, canada, and grow purple sprouting brocs, but am unfamiliar with flower sprouts .. might be something for me to looks into as i love growing veg in the winter ..
Its a hybrid combination of kale and Brussels and Steve’s comment above explains it nicely. They are very hardy to frost and become sweet then, like Brussels. Hi Jane compliments of the season to you and yours. Flower sprout has its own website. If you Google flower sprout I am sure it will turn up.